Santorini International Airport, alternatively known as Thira Airport, is the gateway to the Cyclades island of Santorini. Situated close to the island’s coast, facing the Mediterranean Sea, it is the largest airport in the south Aegean Sea. Santorini Airport additionally serves as a fighter base and is able to accommodate numerous aircraft sizes, such as Boeing 757, Airbus 320 series and Avro RJ. Santorini International Airport (IATA code: JTR) is the eighth busiest airport in Greece with regularly scheduled airlines including Ryanair, Olympic Air and Aegean Airlines. Flights to Santorini International Airport are provided by international airlines such as British Airways, Lufthansa and easyJet. JTR is a 12-minute drive from the city centre of Fira. Book your cheap flights to and from Santorini International Airport online! Santorini International Airport, situated on the east side of the Greek island, north of Kamari Village, is one of the most active airports in the country. Operated by Fraport AG, JRT began operating in 1972. In 2016, more than 1.68 million passengers passed through the airport’s doors. In 2017, Fraport AG began planning a series of upgrades to further improve the airport’s standard of service. The level of activity that characterises Santorini International Airport is thanks to JRT including all the essentials to ensure travellers have a convenient experience as they prepare to explore the secrets of the beautiful island of Santorini. When you’re waiting for your next flight, why not take the time for a satisfying bite-to-eat at one of the eateries in Santorini International Airport? These establishments are situated on the ground and 1st level in Departures, Airside, as well as on the ground floor in Departures, Landside. Make sure to adhere to the baggage restrictions when at Santorini International Airport. There are currently no lounge facilities at Santorini International Airport. The facilities at the airport include baggage carts, a service for lost items, first aid, currency exchange facilities, ATMs and free Wi-Fi. This charming 3-star hotel near the Archaeological Museum is a 9-minute drive from Santorini International Airport. Amenities include a restaurant, pool bar, outdoor pool, rooftop terrace, air conditioning, daily housekeeping, beach umbrellas, airport pick-up service and breakfast. Free Wi-Fi and free parking are also available. This upscale Messaria apartment complex is an 8-minute drive from the airport. It includes several features, such as an outdoor pool, a rooftop terrace, spa services, airport shuttle, in-room childcare, air conditioning and a hair salon. The complex includes a free full breakfast, free Wi-Fi, and free parking. This elegant 5-star spa hotel is a 10-minute drive from Santorini Airport. It is home to several amenities, such as daily housekeeping, health club, breakfast, outdoor pool, airport shuttle, childcare, terrace, 24-hour front desk, air conditioning, restaurant, and bar/lounge. Free Wi-Fi and free parking are available as well. You can order foreign exchange as early as 60 days before collecting. Take note that you can only make your collections in person. A 24-hour branch of OneXchange is available in the arrivals area. Santorini International Airport offers free parking, which works on a first come, first served basis. Santorini International Airport is situated 6 km southeast of central Fira. 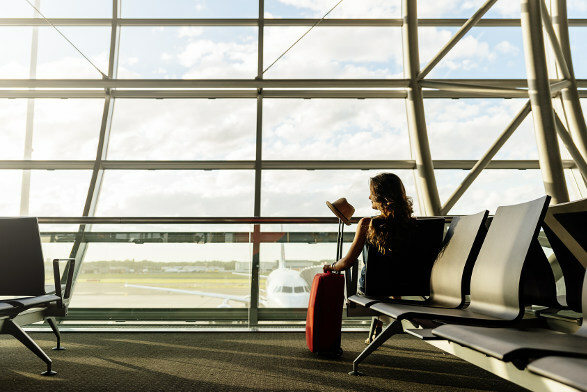 Transport to and from the airport is easy with options including buses, taxis, hotel car pickups and rental cars.